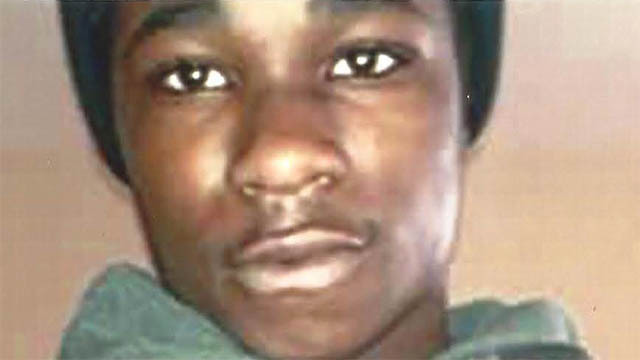 CHICAGO -- Video released Thursday shows a 2013 fatal shooting of a 17-year-old black carjacking suspect by a white Chicago police officer, though footage of the moment the teenager is shot doesn't clearly answer whether the teen turned toward the pursuing officers or was holding anything, as the officer who opened fire has said. A federal judge lifted a protective order on the video of Cedrick Chatman's last seconds after the city -- in a surprise about-face -- dropped its longstanding opposition to making it public. Since the November release of video in a separate case showing a white officer shooting a black teenager 16 times in 2014, city leaders and the police department have come under intense scrutiny over cases of alleged misconduct amid calls for greater transparency. Click below to watch the video in its entirety. Overhead video from a blue-light police camera that city attorneys consider to be the primary footage shows Chatman bolt out of a car and across a street with Officer Lou Toth on his heels. Chatman scoots through parked cars and then toward a nearby intersection. Less than 10 seconds elapses from the time Chatman jumped out of the car to the fatal shots. Toth's partner, Officer Kevin Fry, can be seen trailing farther back, aiming his gun at Chatman from a crosswalk and firing as the teen began rounding the corner in front of a bodega. One video from a camera that pans back and forth is grainy and it doesn't show Chatman fall; another is clearer and shows Chatman fall, but it is taken from farther away and doesn't show definitively if Chatman ever turned. Fry said in a 2014 deposition that he opened fire with his .45 caliber semi-automatic pistol out of fear for his own life and his partner's after Chatman "makes a slight turn" holding an object. "It was a small black object, which I believed to be a handgun," Fry said. Investigators said later the object was an iPhone box. Chatman's mother filed a wrongful death suit against the city and the two police officers. One of her attorneys, Brian Coffman, says the teen never turned toward the officers and posed no threat. "We're hoping it's a system-wide change in the way police misconduct is treated in the city of Chicago, and that's what this fight is about," family attorney Mark Smolens told reporters Thursday, according to CBS affiliate WBBM. Coffman had a different interpretation of the city's release of the video. "It's more of a political move than anything," Coffman said. The Chatman family's civil lawsuit is expected to go to trial in late summer or early fall, WBBM reported. Questions about the Chatman video follow the Nov. 24 release of another video showing white officer Jason Van Dyke fatally shooting black teenager Laquan McDonald 16 times in 2014. The city fought its release for more than a year, making it public only after a state court ordered it to do so. The video and the delay in releasing it led to protests, calls for Mayor Rahm Emanuel to resign and a federal civil rights investigation of the Chicago Police Department. In his deposition, Toth said the officers had stopped the car Chatman was in after a radio report of a carjacking in progress, saying both officers drew their weapons immediately because they suspected the car of involvement in a serious crime. Toth describes nearing the car before Chatman fled, shouting, "Police! Police! Put your hands up.'" Chatman's family had asked that the video be made public, arguing it would counter the city's narrative that Chatman posed a danger to police. City attorney Jonathan Green told U.S. District Judge Robert Gettleman Thursday that the legal basis for withholding videos remains sound. But he also said calculations about when to release footage has changed in the era of cellphone and security cameras. "The city recognizes ... that we are in a new world," he said. "We are making a policy change on behalf of the people of Chicago." After Green spoke, Gettleman sharply criticized the city attorneys for suddenly changing their position on the video's release on policy, not legal grounds after spending weeks trying to prevent it. "I went to a lot of trouble to decide this issue, and then I get this motion last night (Wednesday) saying that this is the Age of Enlightenment with the city and we're going to be transparent," Gettleman said. "I think it's irresponsible." The Independent Police Review Authority, which investigates police shootings, cleared the officer who shot Chatman of any wrongdoing. However, court filings allege that the agency cleared the officer only after an investigator who opposed that finding, Lorenzo Davis, was fired. Davis told WBBM Thursday the video supports his long-held opinion of the shooting. "The shooting was not justified," Davis said. "I feel that [Fry] should have been criminally charged." Davis acknowledged much of video is not clear, but said he and his team watched all of the footage numerous times. Davis has filed a lawsuit over his dismissal. IPRA has declined to comment on Davis' case because the litigation is ongoing. Coffman said Chatman's mother, whom he represents, wanted the public at large to see the video. But he said she wouldn't watch it: "She wants nothing to do with this video."